This articles has been written about guidelines for FHA loan in Florida state. Florida, the Sunshine State, known for its magnificent natural beauty and balmy climate became a part of the union in 1845. The state was named by Juan Ponce de Leon, a Spanish explorer, in tribute to Easter celebration of Spain known as ‘Feast of Flowers’ or ‘Pascua Florida’. Tourism is the leading industry of Florida and millions of visitors come to the state every year to enjoy at the theme parks, natural sites, national parks and the incredible beaches of the Sunshine State. Are you looking to move to Florida? Then we’ll provide some information about the real estate market of Florida. According to Zillow, currently, the median price of homes that are available for sale is $288,000 while the median sales price is $213,400. The home values in the state have gone up by 8.3 percent in the period of last one year and they’re expected to rise 3.1 percent more within 2018. So, what do you think, can you afford a home in Florida? Wait, are you thinking you might not be able to get a loan to buy a home because of bad credit score? That would surely have been a problem some time ago but, not anymore. Now, low credit score buyers can qualify for a mortgage — thanks to the new policy of the Federal Housing Authority (FHA). Let’s see the details of FHA requirements and what the new policy has to offer. With an FHA loan, a minimum credit score of 500 is required to buy a home. There should be a minimum score of 580 to make the down payment of 3.5 percent. However, several borrowers aren’t able to qualify if they don’t have a score of 620 or above. The conventional loans which Freddie Mac and Fannie Mae surely have their own place in the real estate market, but for those with low credit score, they don’t provide much leverage. The FHA fills the gap as it offers a mortgage to those with lower income, low to medium credit score, income from several sources and co-borrowers. Mortgage companies and banks that offer home buyers FHA loans don’t follow every detail of the FHA policies. Most lenders impose rules that are tougher than the guidelines for FHA loan in Florida imposed by the FHA itself. Yet, the FHA penalizes mortgage lenders when they approve bad loans. If borrowers default, then lenders will be penalized by the FHA even if the loan fits the published guidelines for FHA loan in Florida. The FHA has introduced another method of evaluation to identify lenders who approve high-risk loans. The FHA compared an FHA lender with another one on the basis of same geographical location. This is called the compare ratio. So, if a certain FHA lender had 150 percent more loans that were late in payments than other lenders in the area, then that lender could be removed from the FHA’s list of approved lenders. Many mortgage companies and banks faced issues with the compare ratio method. That is because if other lenders in the area had tougher guidelines for FHA loan in Florida for loan approval, they would appear better than lenders who didn’t impose tough regulations. This raised problems as lenders had to raise their minimum credit score requirements to match the other lenders in the area and be in the good book of loans. The important question is how the new policy will help borrowers who have a bad credit score? 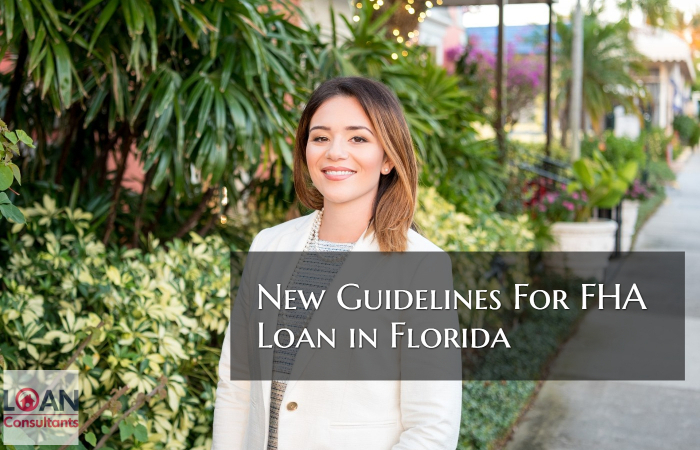 With the new guidelines for FHA loan in Florida, a lender won’t face consequences and lose its FHA loan credential if its low credit loans perform similar to loans in greater credit score rating. In addition, instead of comparison being made on the basis of geographical region, lenders will be compared nationwide. So, lenders can offer FHA loans to low credit score buyers without worrying about being kicked out from FHA’s list of approved lenders. Many lenders have not adopted the new policy as they’re unsure of its results. When you search for an FHA loan with bad credit score, shop around, get in touch with multiple lenders and get quotes from them. One lender may have adopted the new guidelines for FHA loan in Florida, while the other might not have done so. The more you look around, the better options you’ll get. If you have been denied a home loan or have any questions about real estate or mortgage please contact the author, Matt Herbolich, MBA, JD, LLM by phone or text at 786.390.9499 or by email at mherbolich@usa-mortgage.com. Mr Herbolich works when you work, so feel free to contact him any time.